As we enjoy our beautiful flying field this summer I need to take a moment to remind all club members that each and every one of us has the responsibility to protect the environment of the Trentadue families Winery. Keep in mind that this is their home and place of business. They have invited us to be their guests, and to enjoy our hobby on their land. There are very few families in California that would grant us such a gift. That being said I want to encourage all of us to fly in the designated area that we have been given. I cannot stress enough that the Winery buildings that sit directly east of the runway shall never be overflown! The Winery holds events and conducts their business in these buildings. They have employees and guest visiting these premises daily. If you have a AMA insured guest with you make sure they are aware of this simple request from our host. You are a ambassador of the club the moment you enter the property. 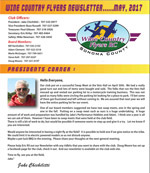 Your conduct reflects upon the entire membership, board members and officers of The Wine Country Flyers. Sunny skies finally greeted the Wine Country Flyers pylon races this year. After last years windy and rainy season it was a nice change. The warm weather brought out fifteen pilots! Paul Gibson, John Reade, Doug Moore, Julio Alvarez, Wylie Walters, Jake Boatman, Dave Mercer, Brian Young, Bryan Germone, Steve Cole, Mark Crowley, Jon Stychno, Paul Kohlmann, Phil Leech, and Myself. And six pilots competed in multiple classes. The T-28/Corsair class had the most entries. Seven in total. Paul Kohlmann and Jake Boatman are tied in the points race with three wins and one cut-out for each pilot. The Parkzone Warbird class had five competitors. We saw our new class with equal speeds with the four different aircraft designs. Two Spitfires, one P-47, one Fw-190, and two Mosquito's raced. Jon Stychno won the points battle for the day. The Dogfighter class had three competitors. Jon Stychno dominated the class with three victories. The EF-1 class had seven pilots signed up to compete but one dropped out with equipment malfunctions. Steve Cole won the day with a victory in every race he ran! 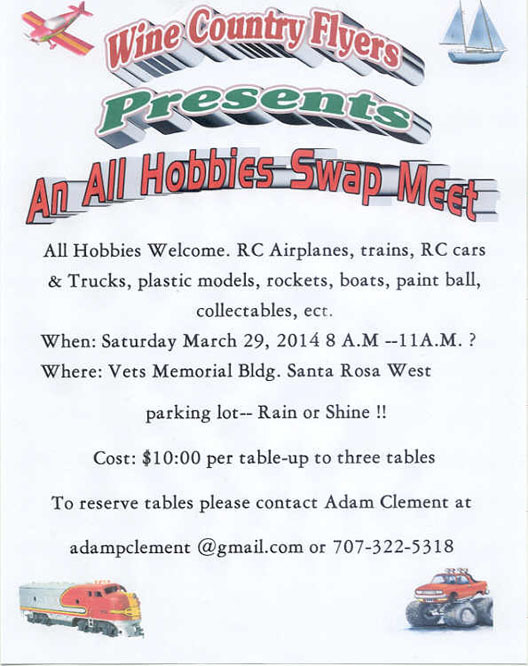 It's that time again, to dust off the old float planes and water toys and have some fun. Our first one is Sunday April 13th. The water level is up, everything looks good. This year we are encouraging people to use the area on the left, as you come in the gate. It's easier access with less rocks to stumble over. I'm working on an Idea for a ramp to go over the rocks if the water level gets low. It involves a sheet of plywood with non-skid strips. If anyone has a good Idea, we would like to hear it. It is daunting sometimes getting your plane in the water. I will be donating 2 dozen doughnuts to the first comers. The donation box will be back for the Salvation Army in appreciation for the use of their lake, but as always it's strictly voluntary. Mark your calendars and join us for some fun on the lake. Bring you chairs, shade, lunch, and your AMA is required to fly.